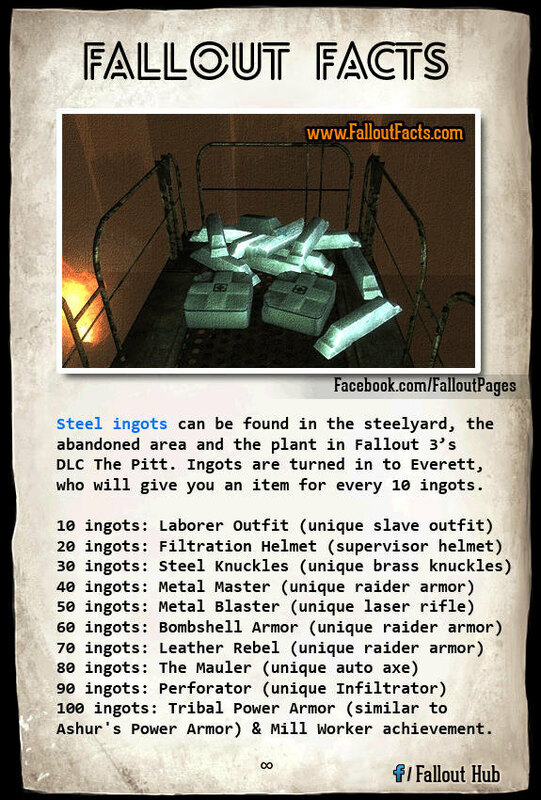 Fallout 3 The Pitt ALL Steel Ingots - where to find them and how to get to them. If you ever wanted to find out all The Pitt steel ingots locations, you're on the right page. Keep reading, go search for them and get all 100 steel ingots! 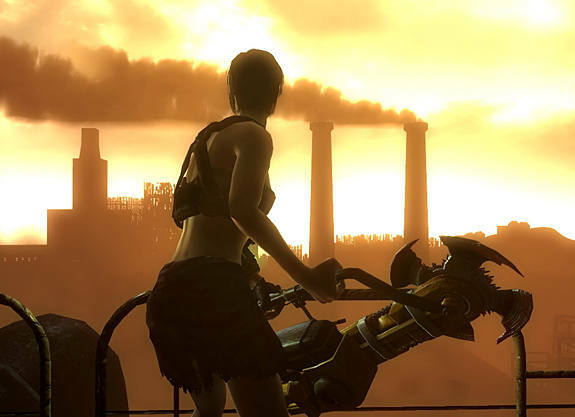 We posted the rewards you get for every 10 steel ingots you take to Everett. Now, let's see where you can find this junk! As soon as you enter the steelyard you'll find 2 ingots next to a dead slave. There's 2 more in the first dumpster to the left (look for the trailer with the couch on top of it). 2 more in the second dumpster to the left. 3 more in the smaller dumpster that sits next to the third large dumpster to your left. Now take the stairs by the dumpsters... After you jump over the broken fence, go right then turn left. There should be 2 steel ingots in between the knocked over barrels. Go north along the ledge. Looking down you should see 2 ingots on top of a freight car. Carefully jump onto the steel beam and walk until you get to them. Now head back up to where you jumped on the freight car and continue along that path until you will need to jump into a dumpster to get 3 more ingots. Once again go back up the stairs BUT now take the left instead of right. You should see a small building to your right; there are 2 ingots sitting on the shelf with Rad-Away and First Aid kits. If you open the gate you went to far; go back! Get out the small building, head through the gate and go straight till you see a large dumpster. Climb up the stairs on top of the building and jump into the dumpster to get 2 more ingots. Now jump from the dumpster over the barbed wire to the south and head right until you reach a dead end, where you will find a dead slave and 2 ingots. Jump back over the fence and head back up the stairs till you get to the roof. Looking down in between the buildings you should see 2 more ingots. Go down, take them, deal with the Trogs, and then open the gate and go left. Down the hill there is a ditch and a dead slave with 3 steel ingots laying next to him. Turn left and look for another 3 into the radiated barrels. Great job! Now go back up to the stairs and jump on top of the building which has a makeshift bridge. There are 2 ingots in the middle of that bridge. Keep moving until you cross to the other side. While still on the roof, head to the back of the building. You should see 2 more ingots sitting on a roof you can drop down to. After that, go all the way down to the ground, where there should be 2 more "waiting" for you on a shelf. Around the corner, you will find 2 ingots behind some stairs. From here, head south till there isn't anywhere else to go. You should see stairs to the right; climb them and you will find 2 ingots next to a dead slave. Go back and continue up the stairs until you'll encounter 3 wildmen inside a makeshift shack. There are 2 steel ingots inside. Keep going until you find another bridge... Kill the Trogs then turn right and head over the big pipe to get the 2 ingots at the end of it. Turn back all the way to the end of the roof and jump behind the building below, where you'll find 4 ingots in a mine cart. Now head east along the wall to your right. You should be following a fence until you reach a dead slave with a combat shotgun and 2 steel ingots. Now you need to go all the way back up, to where you jumped from the roof. This time take the stairs that will take you up to the top of the factory building. At the top of the stairs, turn left and take the first right. You should see 4 ingots by the dome and the dead slave. Now go back and climb the stairs to the very top where you'll find find 12 (yay!) steel ingots. As you go back down you'll notice a large conveyor belt. Jump on it and follow it to the end for 7 more ingots. Head back up to the rooftop with the domes on it and head south till you get to the wall. Turn left and drop down. Make sure you Save first just to be safe; it's a long drop. Now drop to the next platform with the 3 big silos on it. Head all the way east to find 4 ingots next to a dead slave with an auto axe. Go back to where the freight cars are. You'll find 2 ingots at the end of the tracks by the collapsed tunnel. Don't take those, you'll die instantly! Just kidding, you can take them. Go back and look for a bunch of Protectrons lined up and a door. Go inside and head down the hallway. Inside the second room there are 3 steel ingots. Continue on to the lower level of the factory. Follow the tracks down the hallway to the right until you met a couple of wildmen and dead Trogs. There are 8 ingots in an overturned mine cart, make sure you get them all. Now take the hallway to your left and you pick the door with two dead wildmen to find a nice supply of ammo and 6 ingots. When you turn in the last one Everett will say “Yup, guess you got every last one out there. You're one hell of a steeler, kid.” Congratulations! You've completed The Pitt All 100 Steel Ingots challenge. You're a hero.